Song is short, quiet “se-lick,” with accent on second syllable. Description: Sexes similar. Large flat head; large gray bill. 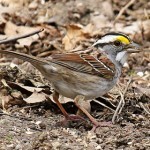 Greenish head, central crown stripe, and nape; black crown stripes and mustache stripes. 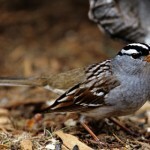 Contrasting dark chestnut back and wings; whitish underparts with buffy breast band and dark streaking on breast and sides. Juvenile is yellower, with less streaking below. Behavior: Secretive; may perch in open for a few minutes after being flushed several times before dropping back into cover. Habitat: Weedy pastures and meadows, abandoned grassy fields, and low-lying, damp pasturelands. Scattered low bushes provide song perches. 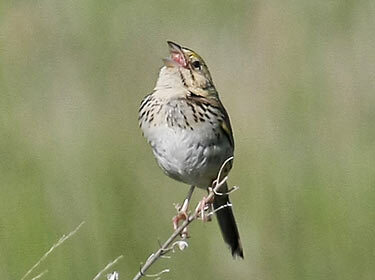 Where in Nebraska: Occasional spring and fall migrant and summer resident in eastern Nebraska. Most records from Adams and Webster Counties. Breeding limited to Lancaster and Washington Counties. 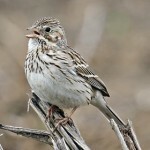 Fun Facts: When Henslow’s Sparrows sing, they are mostly active at dawn and dusk, but will sometimes sing all night.